Belmont Historical Music Row Walking Tour at Belmont University in Nashville, Tennessee, December 6, 2018. Thanks to a special project from Honors Professor of Practice Dr. Mary Ellen Pethel, Belmont students were able to engage with an exciting and emerging new field during the fall semester, digital humanities. Pethel recently completed a post-doctorate certification in digital public humanities, an academic field which applies technology and digital resources to traditional humanities disciplines such as literature, history and philosophy. Dr. Mary Ellen Pethel introduces the Music Row tour. A Nashville history expert and author of the recently released book “Athens of the New South,” Pethel sought two primary learning outcomes for her Digital Humanities Honors course: “to explore the history and significance of Nashville in the context of cities in the human experience and to develop analytical and technical skills related to the field of Digital Humanities.” The four students in the pilot course were challenged to create a walking tour of Music Row for their final exam. Though their work will eventually be added to the Nashville Sites website, the infrastructure for that site is still in development so the students led the tour in person in early December. The course will be offered again in the spring with more students participating in producing additional tour content. In addition, current audio engineering faculty and students are doing narrations and offering help with recording, editing and exporting files for the tours, which will be available in audio or text versions on the website. 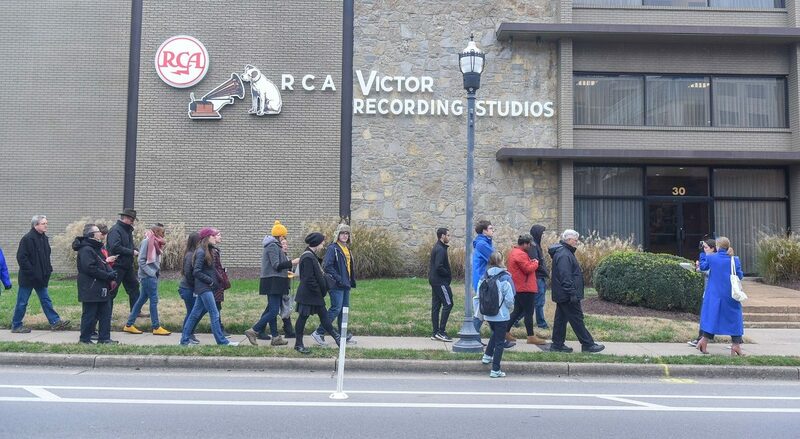 Music Row Walking Tour in Nashville, Tennessee, December 6, 2018. But Belmont isn’t the only local organization assisting with the project. The Metro Historical Commission Foundation and the Convention & Visitors Corporation along with several individual donors are all supporting the creation of Nashville Sites. Other universities are involved as well, with an intern from Vanderbilt and narrators from Tennessee State contributing. When complete, physical medallions will be placed on signs throughout the city, providing QR codes to connect to the tour website. Pethel believes Nashville Sites will offer the city’s natives and tourists alike engaging, self-directed, historically accurate tours of Nashville that are scholarly and ad free.